On or about 6 months ago, my left eyelashes started growing all haywire–when I would blink, they would catch, point straight down, curl in toward my eye–not normal. Now for those who don’t know me, I am blessed with very long eyelashes, and for that I am thankful. But sometimes said eyelashes can be a lot of work! Mine are long and just kind of thick, so I usually go for a volumizing mascara. I ended up having a whole section of empty eyelashes where they all ended up falling out, or I just got disgusted and ended up cutting them or actually plucking them out. I know, I know–big mistake. But it was so frustrating! They were going the wrong way! So, what to do, what to do…hmmm…. At about this point, I read about Revitalash (to purchase go to RevitaLash, available at AskDerm.com) , which is a product on the market that contains prostaglandins that somehow make your eyelashes grow. It is derived from a drug that was originally a glaucoma eye drop and the drugmakers realized that the patients had marked eyelash growth while using it. The pharma drug is called Lumigen, and you can get a prescription for it and pay $150, and it is actually over 100 times stronger than the Revitalash; however, I was looking for the quick fix. So I hiked it over to my local Planet Beauty and got my lovely blue tube quick as a jackrabbit. *Sorry for the red eye, but check out those lashes! I find the easiest way to remove my mascara is to use Almay eye make-up remover pads (non-oily), available at any pharmacy. Just make a little sandwich with the pad over your lashes and gently squeeze–your mascara will come right off! These pads are gen-ius. And I use waterproof mascara–my eyes tear up a lot (see, again TWO WORDS people!) because of allergies and I find it just yucky and unattractive when you see women with raccoon eyes because they’ve teared up and their mascara is running. Why, why! When there is waterproof! If you apply it correctly, it will not clump. And I have FINALLY found a mascara that I truly love, yes I love it truly, madly, deeply–thank you sister Caren–Dior Show in Waterproof Black. I think everyone should wear black mascara, even blondes and redheads. Lashes need to SHOW girls! 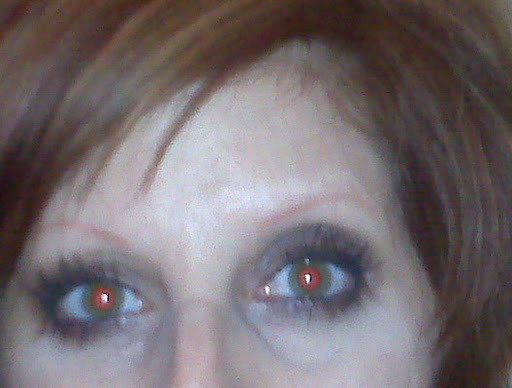 So here’s how to do it: 1) Use a lash prep of some kind: my friend Karen likes the clear one by Ulta. I just use the white one on the end of Maybelline or Loreal’s two sided mascara/prep combo. Let it dry completely. 2) Curl lashes ONLY with this fabulous curler: Shu Uemura, available at http://www.sephora.com/. Nothing else even comes close, and it’s also InStyle and Allure’s choice curler many years running. 3) Apply mascara ONLY after wiping excess from tube back into the tube–but don’t pump it–this draws air into the tube and dries it out. Also never wipe it with a tissue–this adds fibers from the tissue onto the wand, which then go back into the tube, and that just mucks up the formulation and makes it clumpy. Okay, moving on. 4) Holding the wand vertically, tip up, dot each lash at the root–I start at the outside and go in. Always put more product at the outside than the inside to open up your eyes. This also creates the look of liner if you want to be lazy or don’t apply liner. 5) Next hold normally and apply to the tips of your lashes and here’s the kicker–do BOTH sides of your lashes…that’s right girls…do the tops of your lashes also. This is where you will really notice a huge difference in your lashes if you’ve never done this before. Makes sure to look down until the mascara dries so you don’t have smudges on your brows. 6) Finally do the middle or main part of the lashes, again on both sides, concentrating more product on the outer third. 7) Repeat while mascara is still slightly wet, or tacky. 8) Once lashes are completely dry, you CAN recurl them if you must, just be sure your curler is totally clean–any dried mascara or shadow will strip all your hard work right off. If you keep dipping your brush and wiping off the excess for each step, you should not have clumps. If you do, use a dry brush saved from an old tube that you have washed off and run it through. I personally don’t like eyelash combs because I think they just remove all the product. 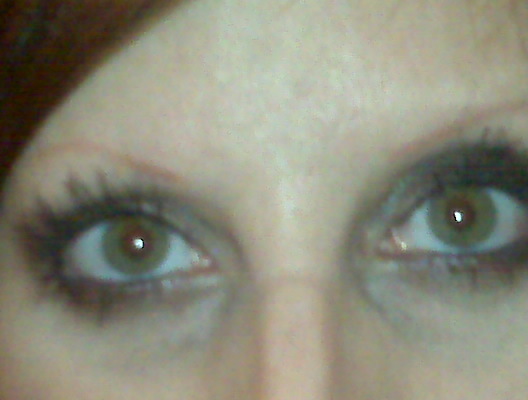 Also, I just discovered the Japonesque lash heater (available at http://www.planetbeauty.com)–the/ name says it all. You use it AFTER you put on your mascara and it’s still slightly tacky–great for those growing straight down lashes that just won’t curl. Also, fix any mistake with a Q-tip dipped in the Almay remover pad jar. Finally (yay! ), I apply my eye make-up first, then do my face. That way, you don’t get mascara, eye shadow, etc., on your foundation, concealer, etc. Just makes more sense to me. So, there you have it. Girls with eyelashes have to do a lot of work to make them look good. At least I haven’t gone off the deep end and gone the route of eyelash extensions, or worse, an eyelash transplant (see last month’s Allure)–eek! Of course, men do nothing which is just so unfair. My son’s are seriously 1-inch long and black. Amazing. Girls will swoon. And all he has to do is blink. P.S. Sorry sorry sorry: my panel of experts (me, myself, and I-ha!) reminded me that I neglected to tell you that you should always put mascara on your bottom lashes–if you have them there, that is. I think it’s ridiculous for make-up people to tell you not to–as long as you put concealer over any dark circles you have, you should ALWAYS play up lashes; however, one coat is plenty. I think I’ve made my point. « How much is that computer in the window?